Innovative app downloads from the featured in download sites! Investigate the featured software utilities families, check the newest updates of the amazing tools, and obtain for free! Do not miss opportunity to try the greatest applications: employ SoftEmpire directory to acquire software program for free of charge. Have a look on the collection of shareware and package versions. Select among system softwares, recieve manipulators, softwares for relax, and all other kinds of applications for your notebook or mobile accessory! Windows mobile Pocket PC forensic utility display entire details (hardware / software) of Pocket PC, PDA, Handheld PC, Smart phone and other similar devices. Investigation application support all manufactures of windows mobile including Asus P525, Asus P505, T-Mobile MDA, O2 XDA Flint, Voxtel W740, Carrier Devices i-Mate, Samsung SGH-i300, Hitachi, Motorola i930, O2 XDA Flint, Sierra Wireless Voq Phone, UTStarcom PPC 6700, UTStarcom XV6600 and other brands available in market. PDA examiner program describe hardware details (manufacture name, model number, battery status, processor type etc), mobile IMEI number, SIM IMSI number, database records including files information (name, type, size) and operating system registry records in easy and efficient manner. User can see entire revealed information at screen of its laptop / desktop computer or save at specific location in txt file format. Software supports all windows operating system including 98 to Vista (all editions) and available with step by step inbuilt help manual. Graphical user interface based application effectively used by investigation department, scientific analysis and other forensic department. Application does not require additional hardware to run and provide complete install and uninstall support. 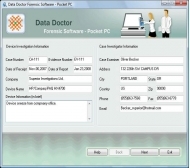 * Determine entire hardware / software details of all Pocket PC, PDA and other windows mobile. * Investigate OS type, registry details, database records and other saved files information. * Support all manufactures of windows based mobile phone including Samsung and Hitachi. * Display mobile IMEI number, model number, SIM IMSI number and many more. * Inbuilt help option which describes step by step software working procedure. * Easily work with all Microsoft windows based OS like 98, 2000, 2003 server, NT, ME, XP professional and Vista. * GUI based application easy to use for non technical user. Free News & RSS reader for PDAs and Smartphones. Get the latest news, sports, gadget news, and SplashData blog feeds right on your mobile device, anytime and anywhere! Significant Sim Recovery tool is only readable utility consequently does not overwrites on formerly added records. Smart sim card data salvage application restores overall sim details for example service provider name, IMSI or card ID number etc. www.bulksmsmobilemarketing.com provides excellent quality Mac Bulk SMS Software for Android to compose and forward multiple text sms globally without using any online internet connecting from Mac pc via connecting android based mobile phone.